Hina Aoyama is a paper cutout artist who has won a number of awards at international competitions in France and Switzerland. Her fantasy-like works depicting shapes such as flowers, butterflies, fairies, and letters, are so elaborate that one may have trouble believing she cut them with only a pair of scissors. 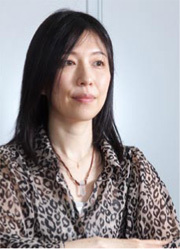 Osamu Sawaji of the Japan Journal interviewed her. 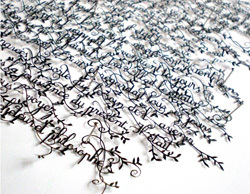 This cutout by Hina Aoyama shapes the paper into the text of Voltaire, and all the letters are linked. 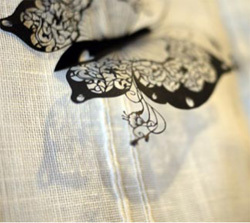 Aoyama's work was exhibited at the sixth Triennial Paper Art International exhibit held in Switzerland in 2008, when Aoyama became the first Asian to win first prize. Hina Aoyama: When I was a child I loved drawing manga. In the fifth grade, I created a small manga magazine with my classmates. I stopped drawing when I entered junior high school but took it up again when I was twenty-nine. I wanted to create a picture book for my son and began to make stories in pictures, where animals and boys were the lead characters. Could you tell us about your first encounter with paper cutouts? Around 2000, I was living in a town near Geneva, and paper cutouts, which are a traditional art form in Switzerland, were popular among the wives of Japanese men working there. A friend asked me if I wanted to make them and once I started I really got caught up in it. I enjoyed drawing figures and then cutting them out. I loved the sense of achievement when the cutouts were finished. I really couldn't stop. When I'm drawing my figures I generally listen to the music of Ryuichi Sakamoto while I sketch the rough draft. It usually takes me around five hours to finish the complete process of drawing figures and cutting them out. A butterfly paper cutout. The thinnest parts are less than a mere 0.3 millimeters wide. What do people say about your works in Japan and overseas? They often say that they are extremely feminine, while also being sturdy. I have lived in cultures completely different from that of Japan and I've had many different experiences that have made me strong. People overseas often say that my paper cutouts of fairies and animals are completely different from the works of Europeans, and that they have a Japanese quality and look manga-like. Which work holds particular memories for you from among your many works? That would be a cutout of text by Voltaire that I created at the request of the town of Ferney-Voltaire, where I'm living now, for my first personal exhibition in 2005. I created this work out of respect for Voltaire, who is closely tied with Ferney-Voltaire, and this is the first work that I sold. The woman who bought it worked for a United Nations agency. She said she had been going through some rough times and my work encouraged her. She was crying when she told me, "I want to look at this every day." I was moved and since then I've wanted to continue to create works for people. From here forward, what challenges would you like to take on? I'm thinking about many different things. There are many very talented artists in the world who haven't achieved success, and I would like to collaborate with them to help them make their debuts. I also have a friend who works for the United Nations High Commission for Refugees (UNHCR), and I'm interested in refugee issues. For example, I am considering helping the livelihoods of female refugees in developing countries by having them produce replicas of works of mine and sell them in Japan.